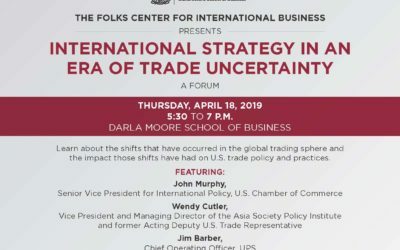 The Sonoco International Business Department and the Folks Center at the Darla Moore School of Business, in collaboration with the U.S. Chamber of Commerce and the South Carolina Chamber of Commerce, are presenting a public forum Thursday, April 18, 2019, 5:30-7pm at the Hootie Johnson Hall in the DMSB. The forum features leading business and policy leaders on the front lines of international trade and investment. An active debate on the future of trade and investment as well as optimal strategies will be followed by a Q&A session with the audience. The lead panelist is John G. Murphy, Senior Vice President for International Policy at the U.S. Chamber of Commerce. Registration is required. Register and learn more here.